Don’t look past this little beauty – catering for pools with up to 35,000 gallon capacity, Zodiac APURE35 slt water chlorinator is so easy to install and will deliver pure, clean water all year round. 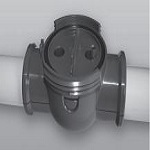 This unit has been designed to deliver chlorine with no fuss installation and no fuss operation. 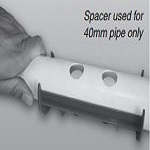 Installation is a matter of drilling 2 holes into the pipe and fitting the quick fit clamping system. The Zodiac has an easy-to-use setup menu which will have the unit running in no time. If you are looking to convert your pool from chlorine to a salt water pool, this is one of the easiest methods on the market today. Install the unit, add salt to your pool, and that’s it! (Please refer to the owners manual for detailed installation instructions and correct salt quantities). The Zodiac features an auto cleaning function for the chlorinator cell that reduces maintenance requirements for you. 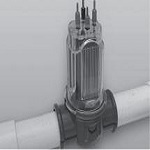 Self-cleaning of the cell by the system is achieved by using reverse-polarity. The system will switch polarities of the cell every 5 hours of operation which helps prevents calcium build up. Like all good leading chlorine generators, the chlorinator cell is easily removed for manually cleaning should the need arise. The cell unit simply unscrews from its base and you will have access to the cell for easy cleaning in the case that there is some calcium build up on the plates. There’s no need to submerse the cell into a bucket of cleaning solution, you can stand the cell and housing and fill the unit up with the cleaning solution. The Zodiac APURE35 is equipped with LCD & LED display panels to quickly give an overview of operating status. There are enough indicators to give you a complete picture and more of the current operating status. The simple to use control unit includes a timer and is intended to work together with the pump/filtration system to ensure maximum efficiency. 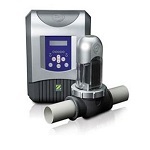 The Zodiac APURE35 features a pump protection feature (in cases of using the EI pump output) which will turn off the pump if the system detects a “no-flow” event for more than 3 minutes. Obviously the system has a water flow sensor to be able to do this. This unit is even equipped with a long life battery that will retain all your settings if there is a power failure to the unit. The microprocessor can even retain some settings even if the back up battery goes flat. This unit is even equipped with a long life battery that will retain all your settings if there is a power failure to the unit. The microprocessor can even retain some settings even if the back up battery goes flat. The Zodiac APURE35 system is warranted for 1 year only by the manufacturer. Given the number of positive reviews for this product, it’s surprising that the warranty period is so short. It’s possible that the manufacturer doesn’t feel that the unit needs a longer warranty period.